The southern Reticulum constellation  certainly isn't a big hit for amateur astronomers. This tiny, bleak and diamond-shaped constellation, not far on the sky from the Large Magellanic Cloud, is often overlooked. But recently, astronomers had a closer look at a galaxy situated inside it. And more precisely at an exploding star hosted by the spiral galaxy NGC 1559 . On the night of August 4, 2005, the renowned Australian amateur astronomer and SN discoverer Reverend Robert Evans discovered a supernova just North of the galaxy with his 0.31-m telescope. The supernova - the explosion of a star - was of magnitude 13.8, that is, only 20 times fainter than the entire host galaxy. Being the 104th supernova discovered in 2005, it received the name SN 2005df. Notably, Evans had already discovered 2 other supernovae in the same galaxy: in 1984 (SN 1984J) and in 1986 (SN 1986L). The following night, astronomer Marilena Salvo and her Australian colleagues classified the supernova as a somewhat unusual type Ia supernova, caught probably 10 days before it reached its maximum brightness. Such a supernova is thought to be the result of the explosion of a small and dense star - a white dwarf  - inside a binary system. As its companion was continuously spilling matter onto the white dwarf, the white dwarf reached a critical mass, leading to a fatal instability and the supernova. These are exactly a kind of supernovae in which Dietrich Baade, Ferdinando Patat (ESO), Lifan Wang (Lawrence Berkeley National Laboratory, USA), and their colleagues are interested. In particular, they study the polarization properties of this kind of supernova in order to learn more about their asphericity, which holds important clues to the detailed physics that governs this terminal catastrophe in the life of such stars. Having an accepted observing programme that uses the FORS1 multi-mode instrument on Kueyen, one of the four Unit Telescopes of ESO's 8.2m Very Large Telescope at Cerro Paranal, they triggered a Target of Opportunity request so that on-duty astronomers at the VLT could observe this supernova, which was done on August 6. From a very first analysis of their data, Wang and his colleagues found that SN 2005df resembles closely another supernova they had studied before, SN 2001el, whose explosion they showed was significantly asymmetric. 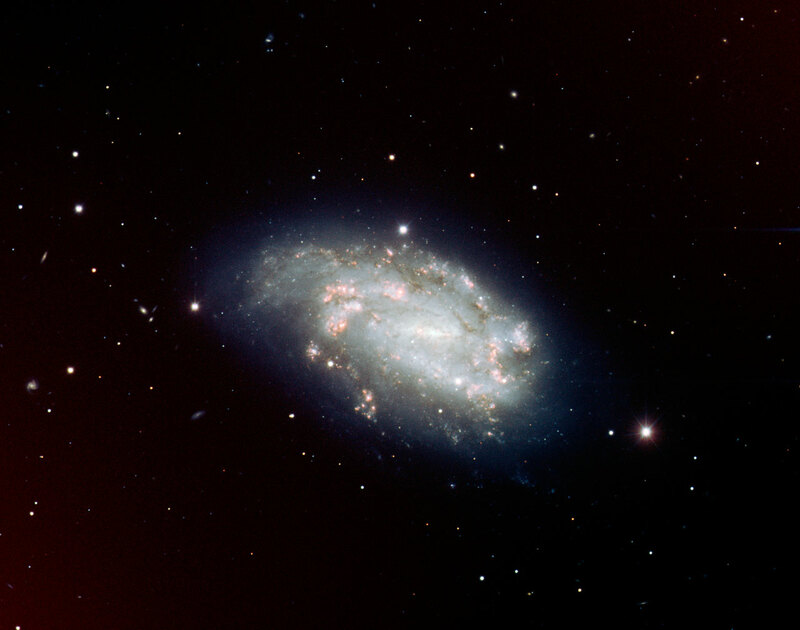 NGC 1559 is a SBc(s)-type spiral galaxy  located about 50 million light-years away, that weighs the equivalent of about 10,000 million of suns, and is about 7 times smaller than our Milky Way: on the sky, it measures about 4x2 arcmin2. Receding from us at a speed of about 1,300 km/s, it is a galaxy of the Seyfert type. Such galaxies are characterized by a bright nucleus that radiates strongly in the blue and in the ultraviolet. Astronomers think that about 2 solar masses of gas per year are transformed into stars in this galaxy. Like most galaxies, NGC 1559 probably contains a black hole in its centre, which should have a mass that is equivalent to 300,000 suns. The Reticulum (the Reticule) was named by French astronomer Nicolas Louis de La Caille (1713-1762), when observing from the Cape between 1750 and 1754. He defined 14 new southern constellations, giving them the names of scientific instruments - e.g. the Telescope - or names taken from the fine arts - e.g. the Sculptor. The reticule was an instrument used to measure the position of stars. "NGC" means "New General Catalogue" (of nebulae and clusters) that was published in 1888 by J.L.E. Dreyer in the "Memoirs of the Royal Astronomical Society". White dwarfs are Earth-size, hot and extremely dense stars that represent the end products of the evolution of stars like the Sun. SBc galaxies are characterized by the presence of stars and HII regions in the bar and spiral arms, by the near absence of a nuclear bulge, and the openness of the spiral pattern. The "(s)" indicates that the spirals are attached to the ends of the bar. Technical Information: The image is a composite based on four images taken with FORS1 on Kueyen (VLT) by Paul Vreeswijk, Dominique Naef and Chris Lidman (ESO) for Dietrich Baade, Ferdinando Patat, and Lifan Wang. The images were taken through different filters: V, R, I, and a narrow-band filter centred on the H-alpha line. The exposure time is 60 seconds in the three broad-band filters (V, R and I) and 3 min in the H-alpha filter. The field of view is 5.5 x 4.7 arcmin2. North is up and East is to the left.